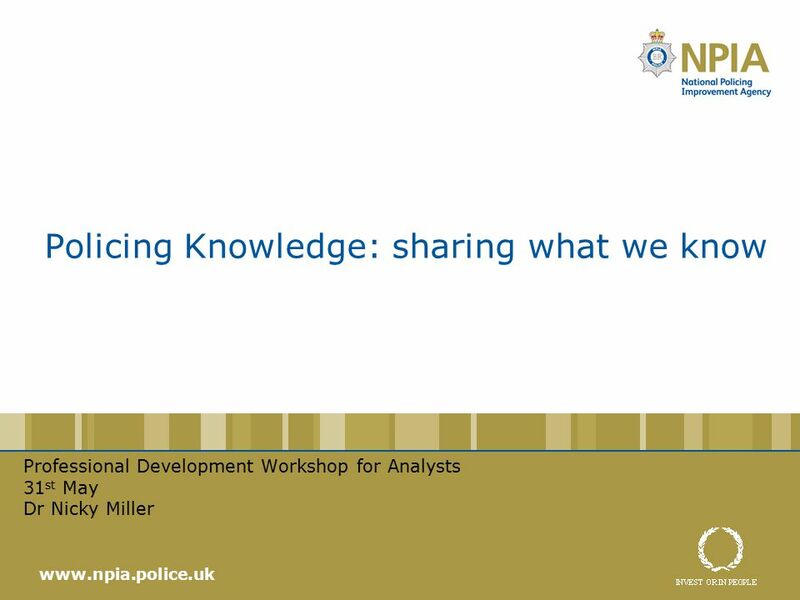 Policing Knowledge: sharing what we know Professional Development Workshop for Analysts 31 st May Dr Nicky Miller www.npia.police.uk. 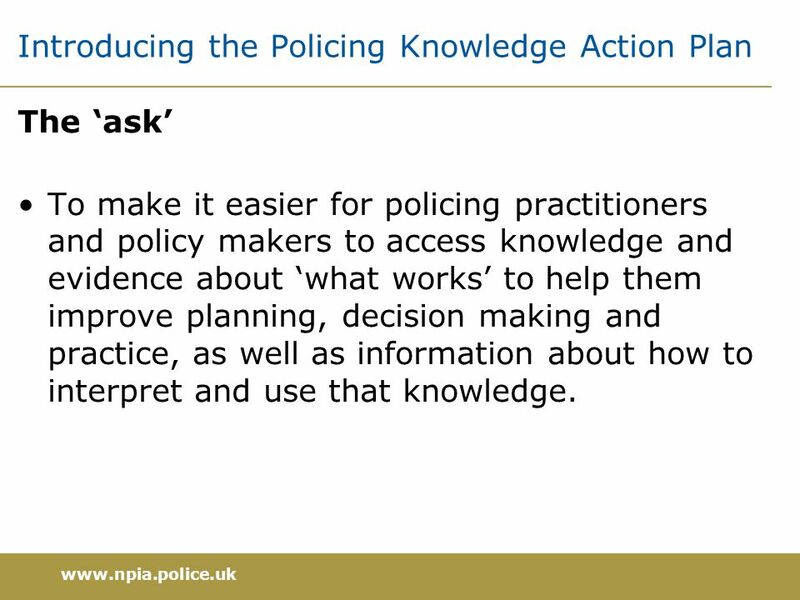 2 Introducing the Policing Knowledge Action Plan The ‘ask’ To make it easier for policing practitioners and policy makers to access knowledge and evidence about ‘what works’ to help them improve planning, decision making and practice, as well as information about how to interpret and use that knowledge. 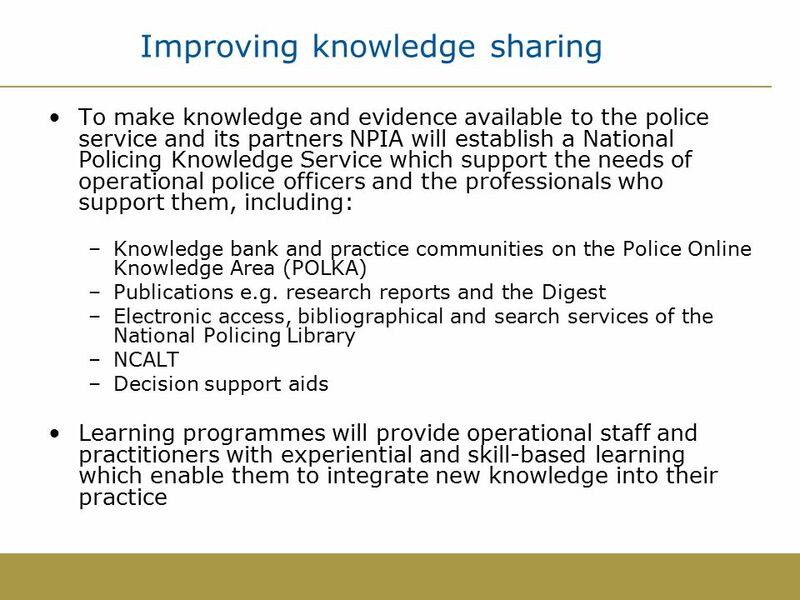 3 www.npia.police.uk Introducing the Policing Knowledge Action Plan The approach Review of the knowledge and evidence available to the service, and the ability of practitioners to share and use that knowledge in practice. 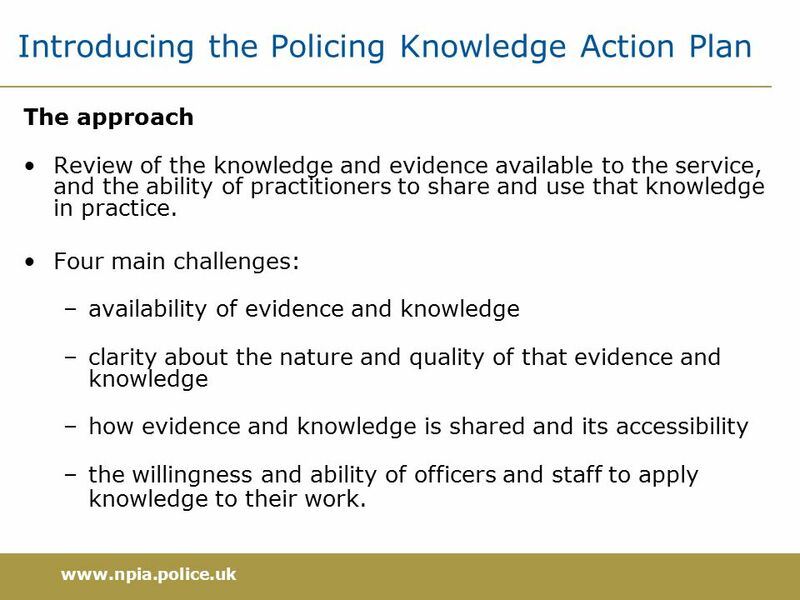 Four main challenges: –availability of evidence and knowledge –clarity about the nature and quality of that evidence and knowledge –how evidence and knowledge is shared and its accessibility –the willingness and ability of officers and staff to apply knowledge to their work. 4 Findings: sources and use Creation Assure Share Use Lots of experiential knowledge, not harnessed or coded. But can build on learning from guidance development, de-briefs and “lessons learned.” Underdeveloped research knowledge. But there is empirical work to build on (e.g. crime reduction, DNA, confidence); partners’ wish to contribute; NPIA-managed data; Policing Science and Innovation Strategy. Knowledge not described uniformly or clearly. But can build on appraisal standards and frameworks that exist for some knowledge sources; publication QA processes. 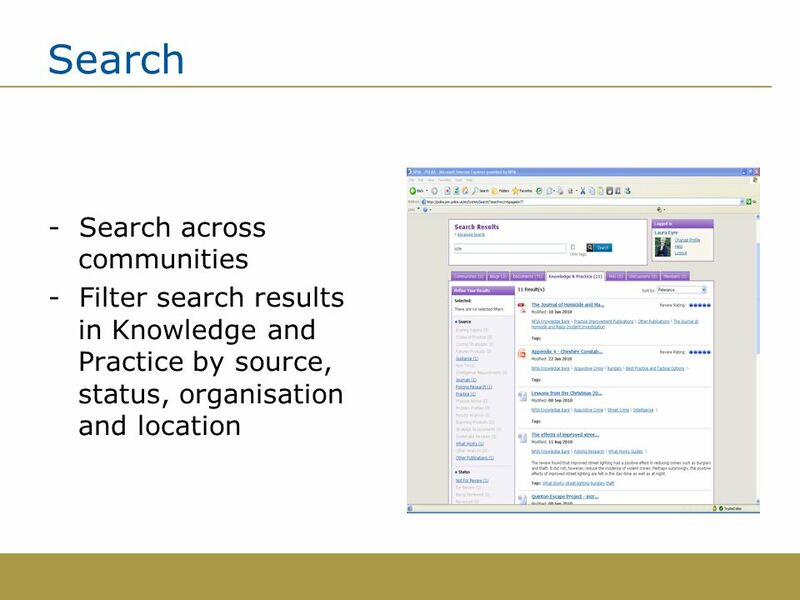 Unsystematic dissemination of knowledge from centre; knowledge not easily sought, found or shared across the service, social networks used in preference to formal search. 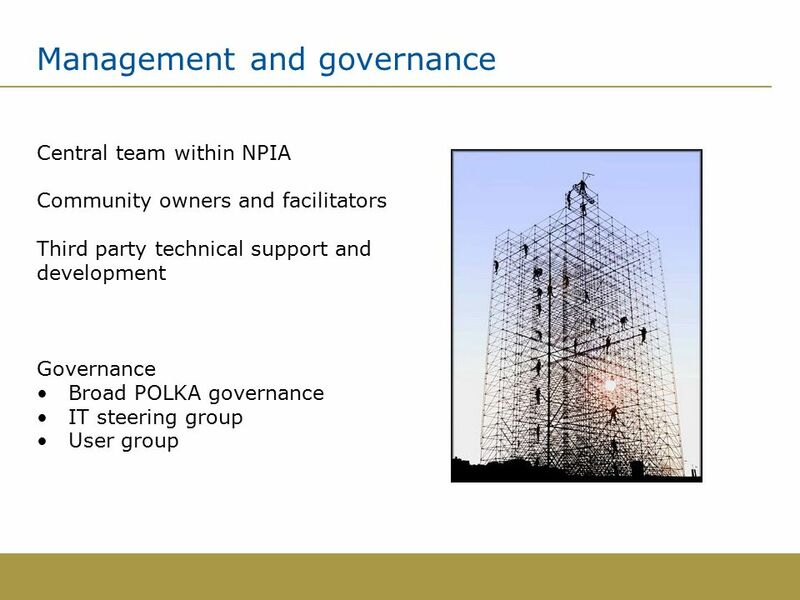 But can build on learning programmes, managed learning environment, capability support, SOC, DIGEST, the library and POLKA. Knowledge is used inconsistently. Users differ in their competence and confidence in finding and using knowledge. 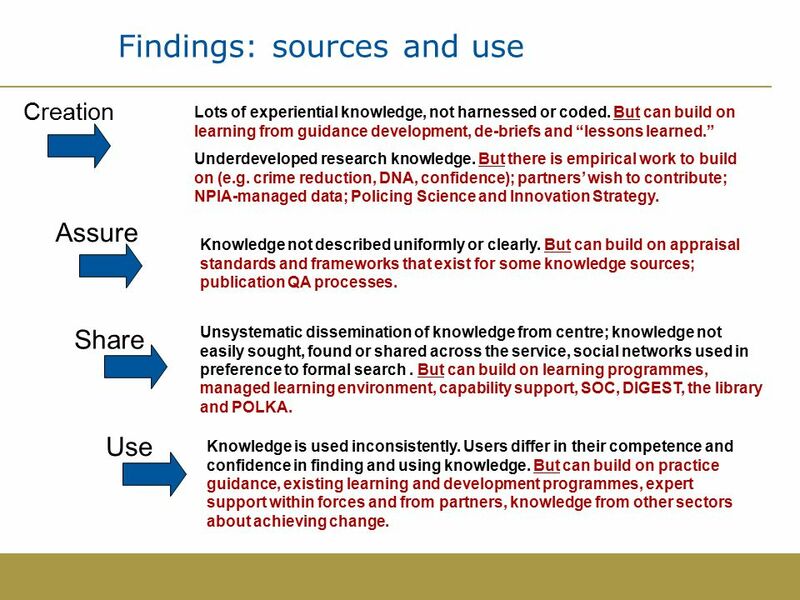 But can build on practice guidance, existing learning and development programmes, expert support within forces and from partners, knowledge from other sectors about achieving change. 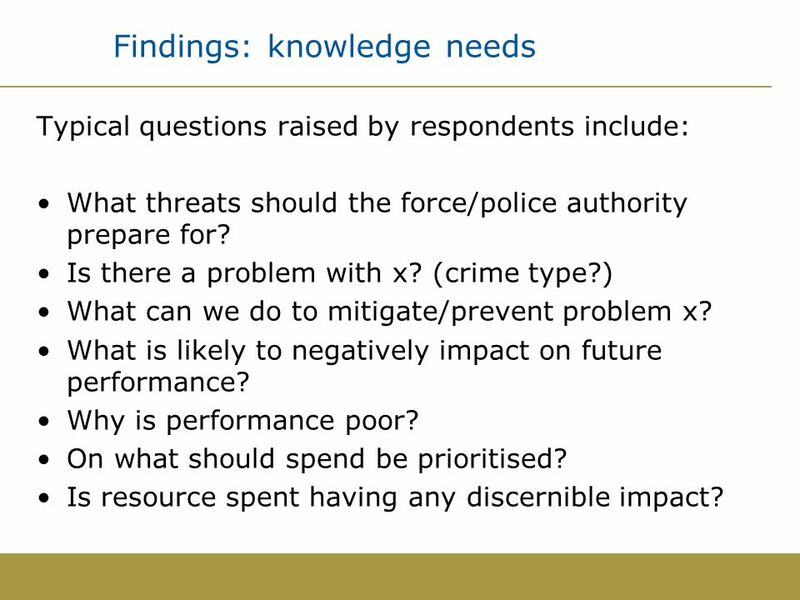 5 Findings: knowledge needs Typical questions raised by respondents include: What threats should the force/police authority prepare for? Is there a problem with x? (crime type?) What can we do to mitigate/prevent problem x? What is likely to negatively impact on future performance? Why is performance poor? On what should spend be prioritised? Is resource spent having any discernible impact? 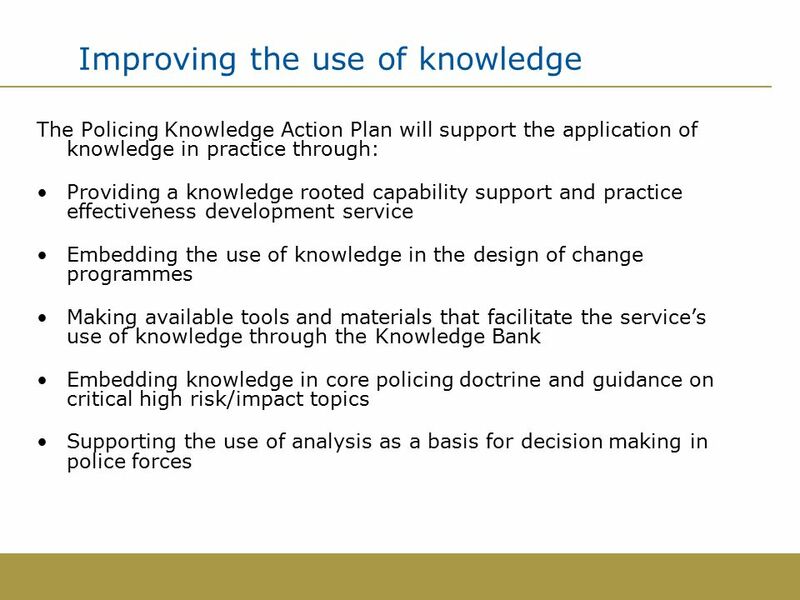 6 Improving knowledge creation To improve the coverage and quality of the available knowledge base, on behalf of the service, the Policing Knowledge Action Plan for creating knowledge includes: Management of a policing futures programme that includes the delivery of horizon scans and analysis about future threats, pressures and opportunities. 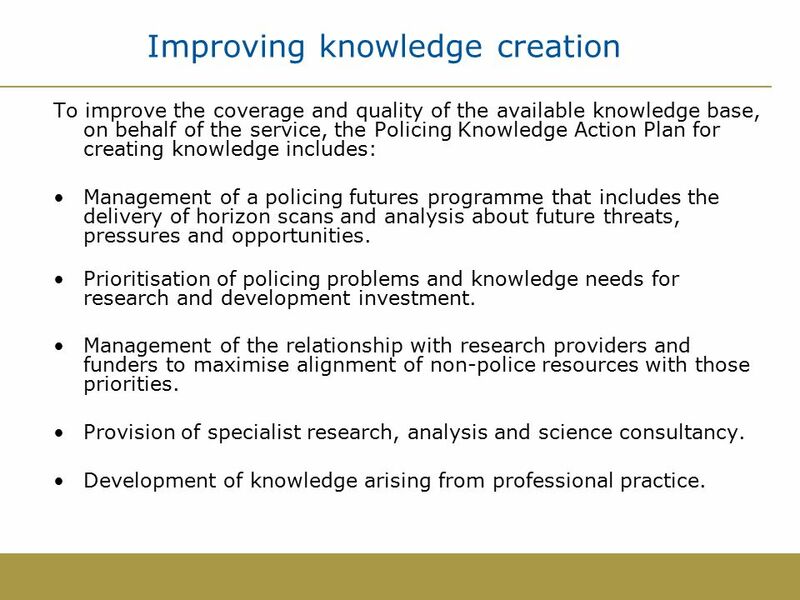 Prioritisation of policing problems and knowledge needs for research and development investment. Management of the relationship with research providers and funders to maximise alignment of non-police resources with those priorities. Provision of specialist research, analysis and science consultancy. Development of knowledge arising from professional practice. 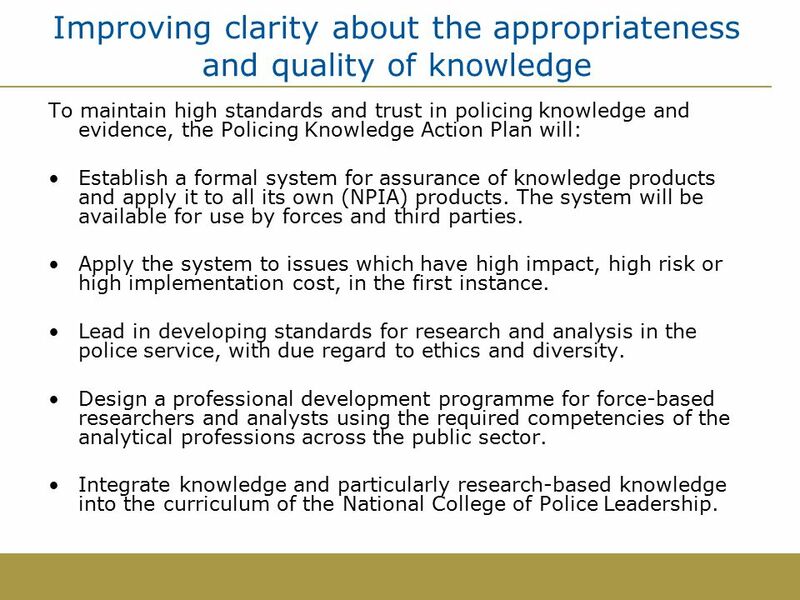 7 Improving clarity about the appropriateness and quality of knowledge To maintain high standards and trust in policing knowledge and evidence, the Policing Knowledge Action Plan will: Establish a formal system for assurance of knowledge products and apply it to all its own (NPIA) products. The system will be available for use by forces and third parties. Apply the system to issues which have high impact, high risk or high implementation cost, in the first instance. Lead in developing standards for research and analysis in the police service, with due regard to ethics and diversity. Design a professional development programme for force-based researchers and analysts using the required competencies of the analytical professions across the public sector. Integrate knowledge and particularly research-based knowledge into the curriculum of the National College of Police Leadership. 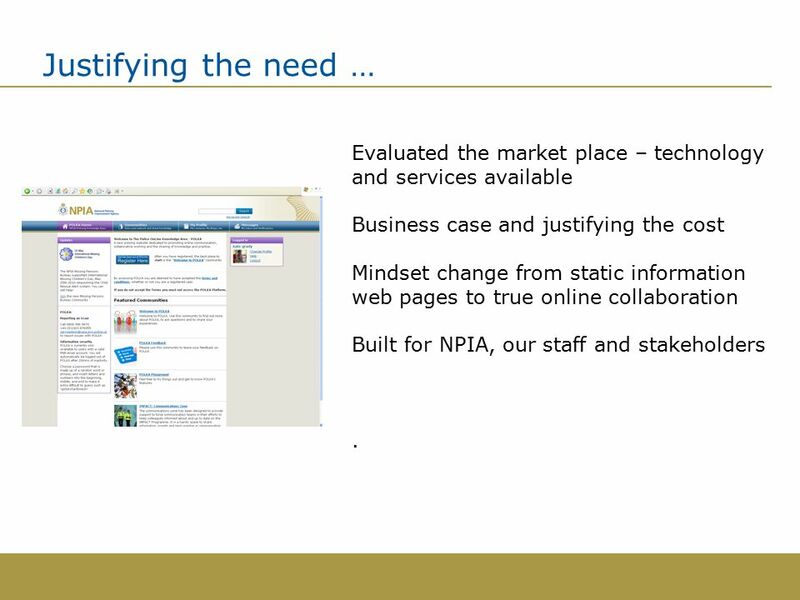 11 Justifying the need … Evaluated the market place – technology and services available Business case and justifying the cost Mindset change from static information web pages to true online collaboration Built for NPIA, our staff and stakeholders. 12 The Origins of POLKA …where it all began. Mar 2011 Identification of requirement for a cohesive online approach; supporting business objectives by enabling web- based collaboration and knowledge sharing. Oct 2008 POLKA conceived and funding secured. 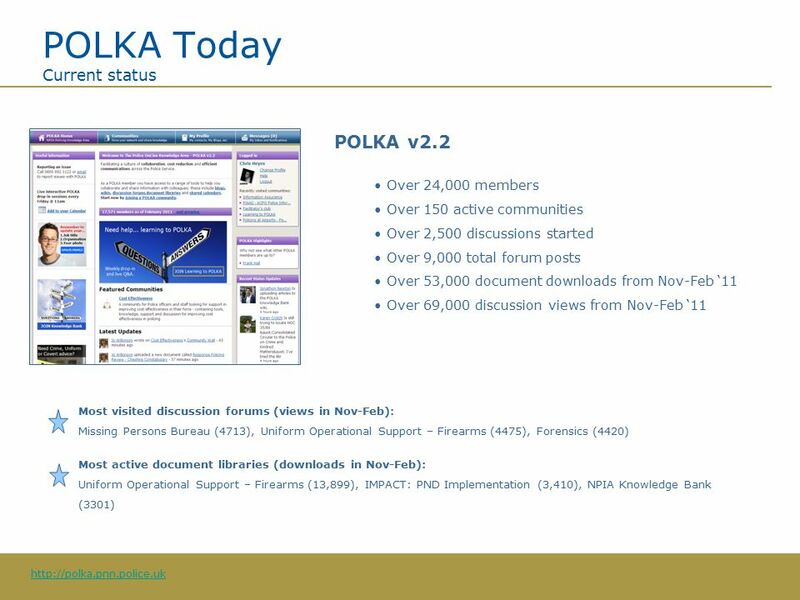 Dec 2009July 2010Jan 2011 POLKA launched with early adopter communities* already live; Extranet sites are migrated. 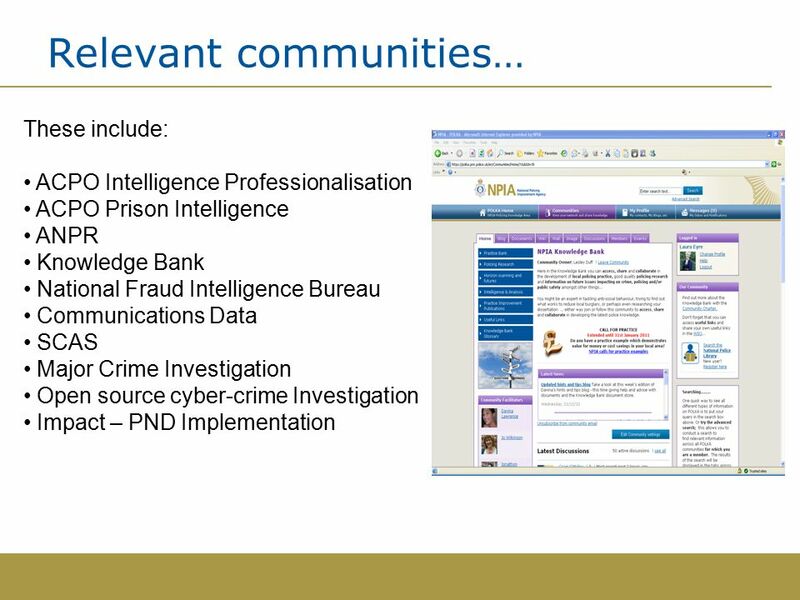 *Forensics21, Information Systems Improvement Strategy (ISIS), People in Policing and Capability Support and The Knowledge Bank POLKA 2.1 introduces improved search, tagging and notifications. POLKA 2.2 introduces more content surfacing, improved notifications and status updates. Sep 2009 5 x early adopter communities* created. First members begin to register. 10,000 members registered. 120 active communities. Over 17,500 members registered. 150 active communities. 13 POLKA Today What is it, how and why? 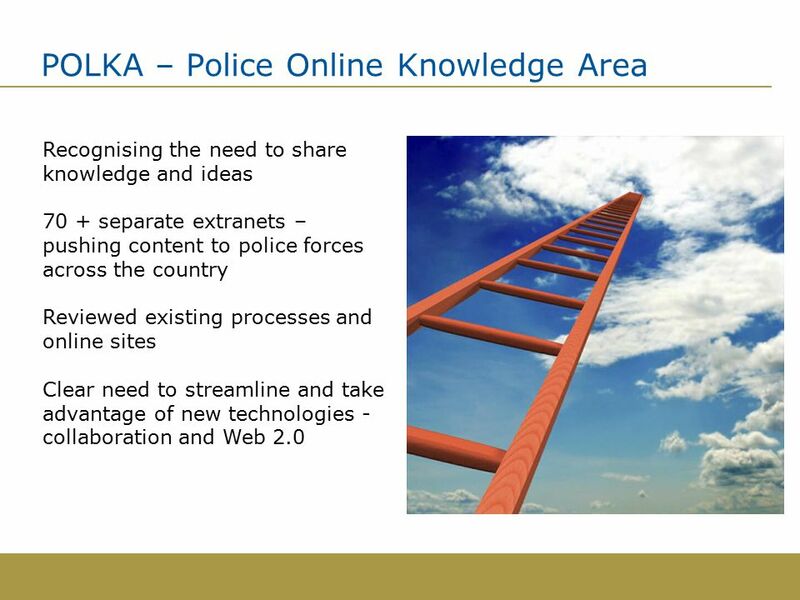 Principles Web 2.0 – Moving away from “one-way” communication A shared, common platform – A single, cohesive solution Knowledge and information sharing – Removing historical barriers Collaborative working – Improved efficiency and increased value http://polka.pnn.police.uk Use blogs to provide news/updates that community members can interact with via commenting. Share and collaborate on documents. 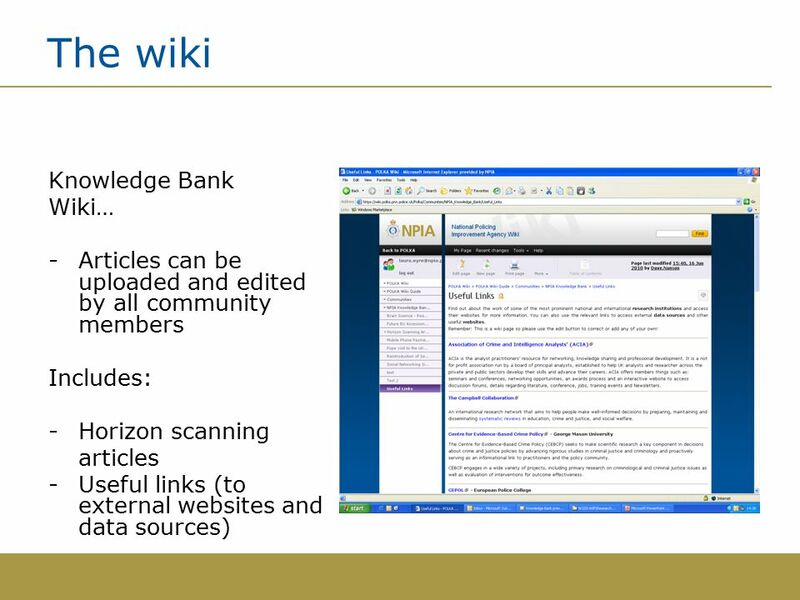 Create collaborative content with Wikis. 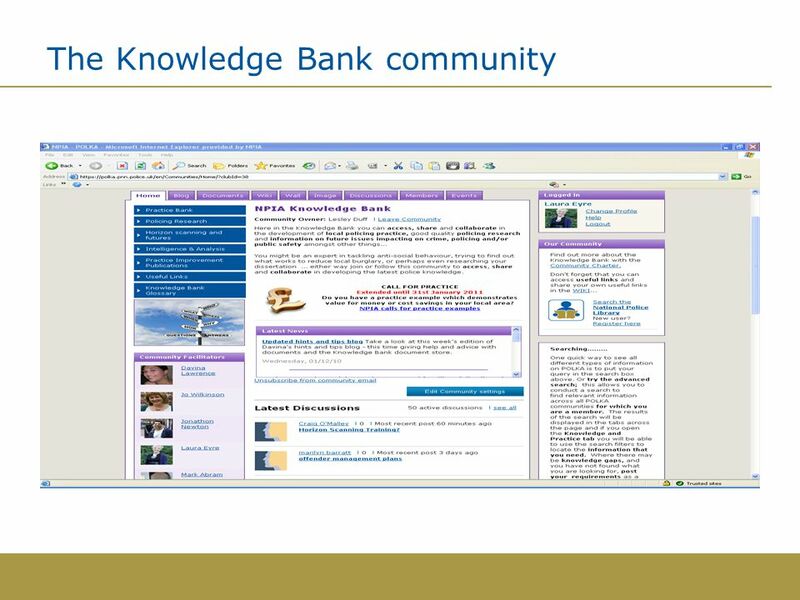 Discussion forums enable interaction and collaboration across forces and partner agencies. Each community has a calendar which can be updated to promote and manage events. Search and contact other POLKA members to build your professional network. 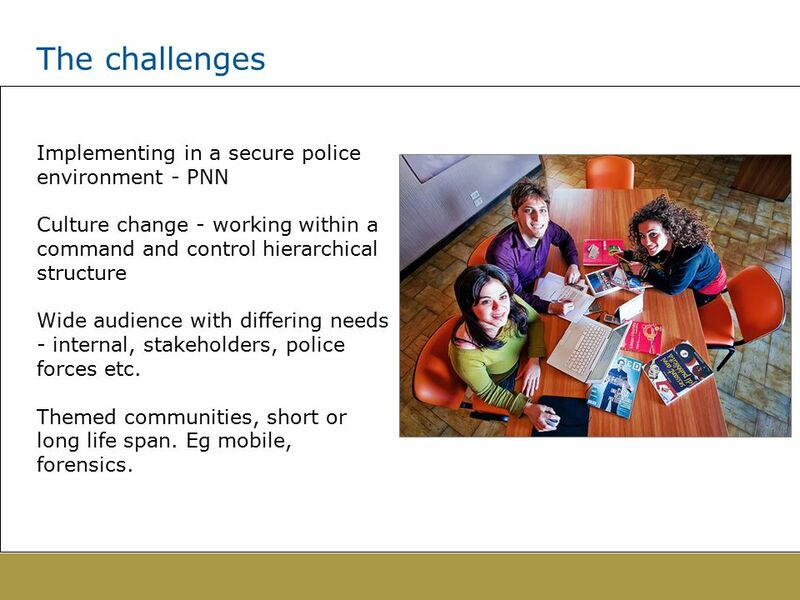 14 The challenges Implementing in a secure police environment - PNN Culture change - working within a command and control hierarchical structure Wide audience with differing needs - internal, stakeholders, police forces etc. Themed communities, short or long life span. Eg mobile, forensics. 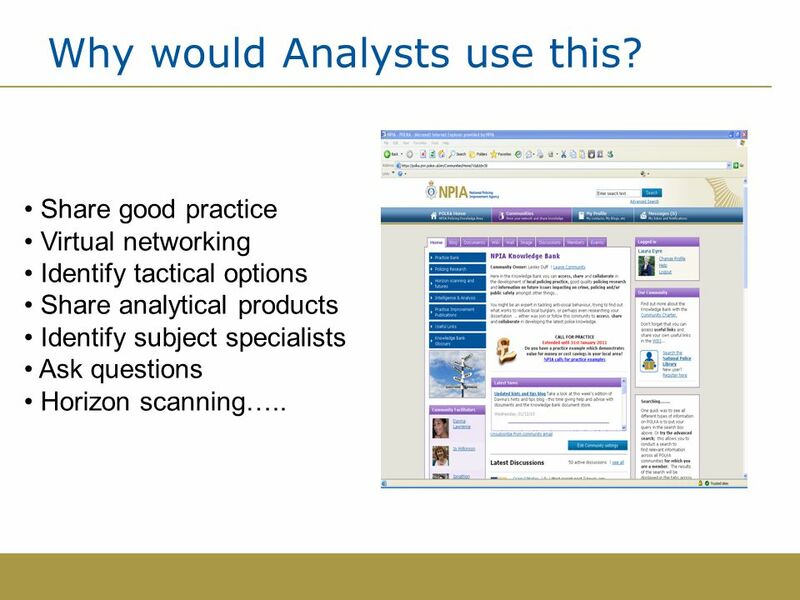 21 Why would Analysts use this? 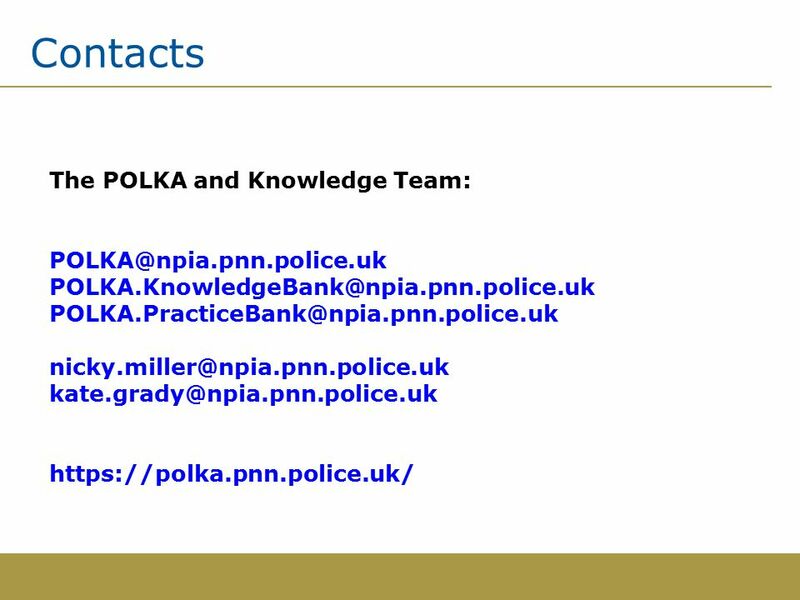 Share good practice Virtual networking Identify tactical options Share analytical products Identify subject specialists Ask questions Horizon scanning…..
Download ppt "Policing Knowledge: sharing what we know Professional Development Workshop for Analysts 31 st May Dr Nicky Miller www.npia.police.uk." Cultural Competency in Health Cultural Competency in Health. Strategy 2022: A Holistic View Tony Hayes International President ISACA © 2012, ISACA. All rights reserved. Technical Review Group (TRG)Agenda 27/04/06 TRG Remit Membership Operation ICT Strategy ICT Roadmap. Revalidation – Management and leadership 11 November 2014. Implementing Sustainable Development Sustainable Procurement & Corporate Social Responsibility Achieving Level 3 of the Flexible Framework. The Crown and Suppliers: A New Way of Working People & Security15:35 – 16:20 Channels & Citizen Engagement Social Media ICT Capability Risk Management. Continuing Professional Development Tegryn Jones Policy and Planning Officer. supported by a local government initiative sharing nationally to improve services locally A-Z & Knowledge Base Project Sheila Apicella. 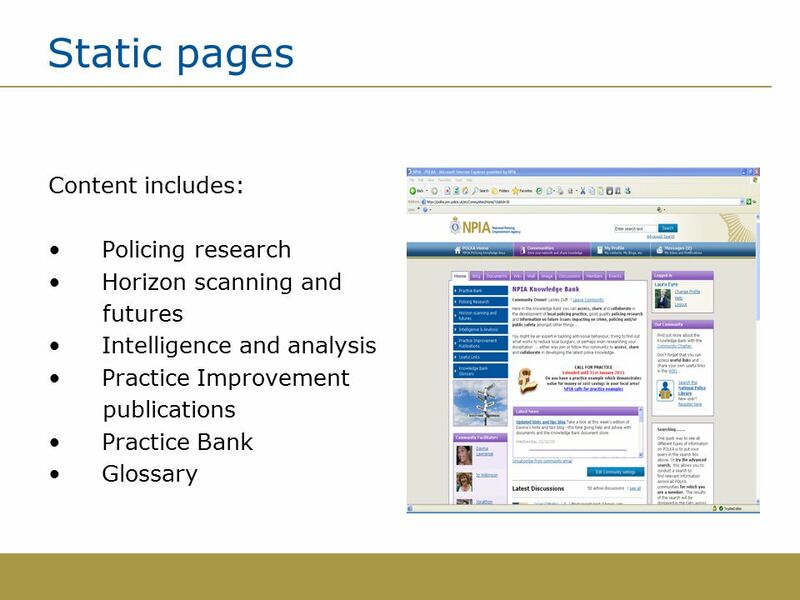 Application of E-learning Materials & Processes to Support Police Learning & Development HMIC Desktop Review & Analysis. 1 Jon Whitfield Agency CEO Head of Government Internal Audit. 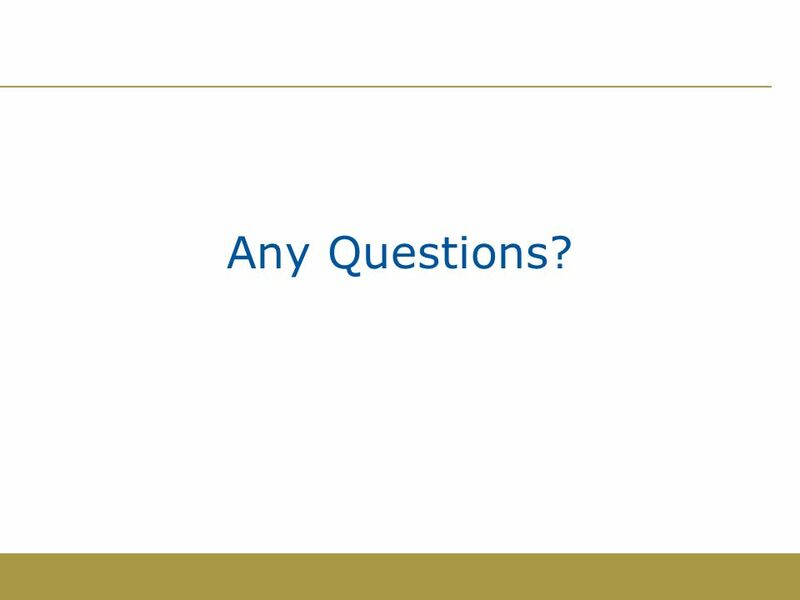 Diana Laurillard Head, e-Learning Strategy Unit Overview of e-learning: aims and priorities. STRATEGIC DIRECTION UPDATE JANUARY 2013. THE VISION AND MISSION THE VISION: ENRICHING LIVES AND CREATING SUCCESSFUL FUTURES. THE MISSION: EDUCATION EXCELLENCE.